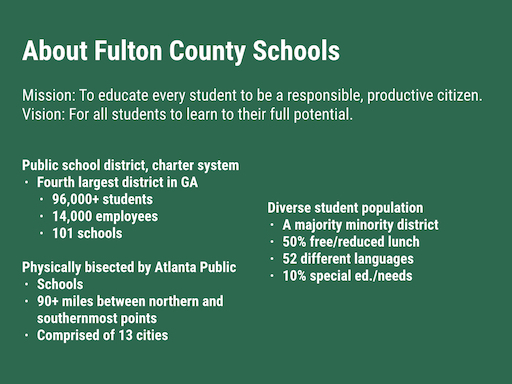 In 2012, Fulton County Schools embarked on a five-year plan with a bold vision to dramatically improve achievement for all students. To do this, the district focused on transforming instruction to personalize learning opportunities for all students. The district defines personalized learning as leveraging technology to place more students and teachers in successful learning environments, creating conditions to make teachers more efficient and effective, and providing students with opportunities to receive the support they need when they need it during the school day. In order to achieve the goals outlined in this definition, the district has been working to build a plug-and-play ecosystem where all applications, tools, and resources will be available in one place. Now five years later, it is time to take a look at how the plan has evolved and the degree of success achieved. The district’s demographics are unique; it is an urban district stretching 90+ miles from end to end with another school district (Atlanta Public Schools district) splitting Fulton County Schools in half. These realities have an impact on how the district has chosen to go about implementing personalized learning. The geographical differences create a widely varying array of differences in the types of students served in the 100+ schools in the district. With the goal of serving all ends of the achievement spectrum for this diverse student population, the digital ecosystem has evolved to include a digital citizenship curriculum, teacher digital resource pages, a virtual school, an instructional management system, a learning management system and a digital marketplace for e-books, audio files, videos, education apps, instructional software, productivity tools and analytic reports. Serena Sacks, chief information officer for Fulton County Schools, has been at the helm of this effort since the beginning. As a district which empowers school leaders to determine what instructional resources and tools will best meet the needs of their students, Sacks knew they needed a way to offer all 100+ administrators a way to choose what they need and for IT to be able to efficiently support all of their choices, while keeping costs in check. As a result, the district developed an instructional marketplace. This marketplace makes it easy for school leaders and teachers to choose the resources that are the best fit for their students. Sacks notes, “Our schools get a lot of autonomy because of the diversity. We have to let school leaders do what they need to do for their students. The marketplace helps solve that issue.” District leaders agreed and supported the notion that technology enables learning. “If you have a school day that is x hours, everybody has the same amount of time to learn. It’s not always fair because students learn at different paces. Employing learning technology removes the constraints of time and place,” says Sacks. Fulton County Schools is one of the several districts expecting their technology suppliers to conform to the IMS Global standards that have been put in place by the member community. Other interested districts can join the same pledge to expect action at imsglobal.org/k12action. As options for digital support are increasing, districts are challenged to select and combine the right technology to meet their needs. By adopting IMS Global standards, all K-12 school districts can simplify workflows for educators and students, reduce costs and implementation times, minimize risk when designing systems architecture for digital learning, and streamline the gathering of analytics to improve learning outcomes.The IMS Global Certified Product Directory (imscert.org) contains a listing of nearly 400 products which have implemented and proven to conform to the IMS Global standards for which they were tested. The rigorous conformance testing process provides peace of mind to districts when choosing which products to use. "The more vendors who are IMS conformance certified; the more easily we can integrate a wide range of digital offerings and support our schools effectively." Sacks says, “It was also important to build a coalition among district and school leaders so that everyone supported the plug-and-play ecosystem concept.” To do this, Sacks reached out across all district departments to build relationships and keep the focus on the mission and purpose so that people could come together around solutions that work. She notes that one of the challenges has been being prepared to support different paces of implementation in various schools. “Just as all students learn differently and at different paces, adults need the same opportunity to make the transformation to a new approach to learning and teaching,” asserts Sacks. Membership in IMS Global has been a powerful arrow in Sacks’ quiver to achieve the district’s goals. Sacks notes that her team has been able to achieve single sign-on for content and data using IMS Global’s OneRoster® standard that helps the district achieve greater personalized learning. The standard includes implementation options to make it quicker and easier to implement the exchange of information about people, membership, courses, and outcomes. In addition to the standard, OneRoster includes a format for CSV files that are typically exchanged between the institution and the vendor to populate the roster information needed to gain access to learning tools, portals, and learning environments. The feedback from teachers and students has been very positive. Students love having devices and access to digital content. Sacks notes that with over 7,000 teachers, there have only been a few issues.